I’ve just woken up from sleeping for sixteen hours straight, give or take. You’d think that would indicate that our transatlantic flight with Little M was a disaster, but really it was quite the opposite. I think I’m just exhausted from the time change and life in general – so was M by the way I think she slept for 15 hours last night (and she’s sleeping next to me as I type this so she’s about to catch up). 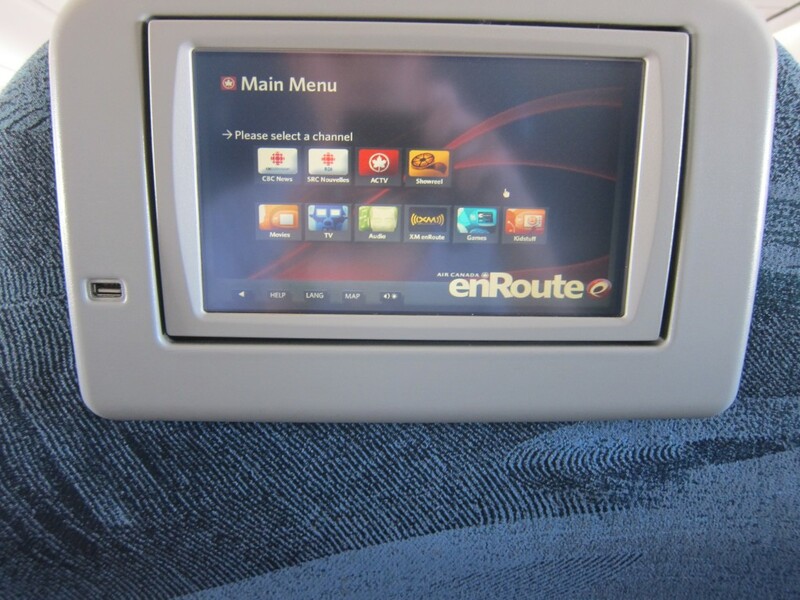 Our day started with a short business class regional flight on Air Canada to Toronto. I wasn’t planning on writing about it (flight was smooth, we preoccupied M by feeding her lunch, and the cabin had extra space so she got her own seat for half the flight), but there were two things of note besides that long parenthetical. First of all, security at Boston Logan for Air Canada amuses me. I mean it’s totally up to regular TSA standards so it’s not unsafe or anything, but Air Canada has three gates and its own little wing, so security is just like one checkpoint. The funny thing was, I was selected for TSA Precheck, but had just assumed that I wasn’t going to get any of the benefits. It turns out at that gate they give you a little slip of paper that says TSA Pre on it and you hand it to the guy on the other side of the metal detector without having to take off your shoes. But I still had to take my laptop out and all that so…thanks? 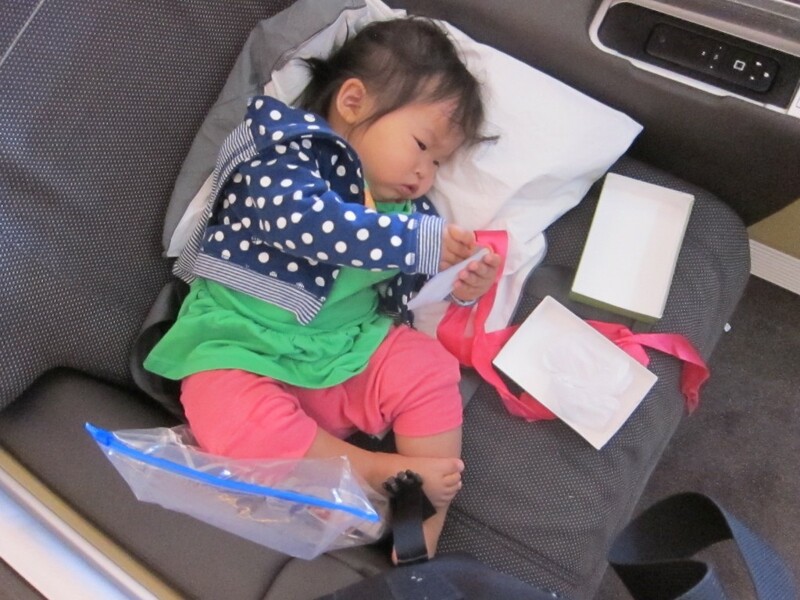 Secondly, it’s always interesting to me how airlines from different countries deal with lap infants. The one universal rule we’ve encountered thus far is no infants in carriers (bjorns, becos, k’tans, whatever). Other than that, everyone has their own policy. On US Airlines, keep them on your lap facing forward for takeoff and landing. 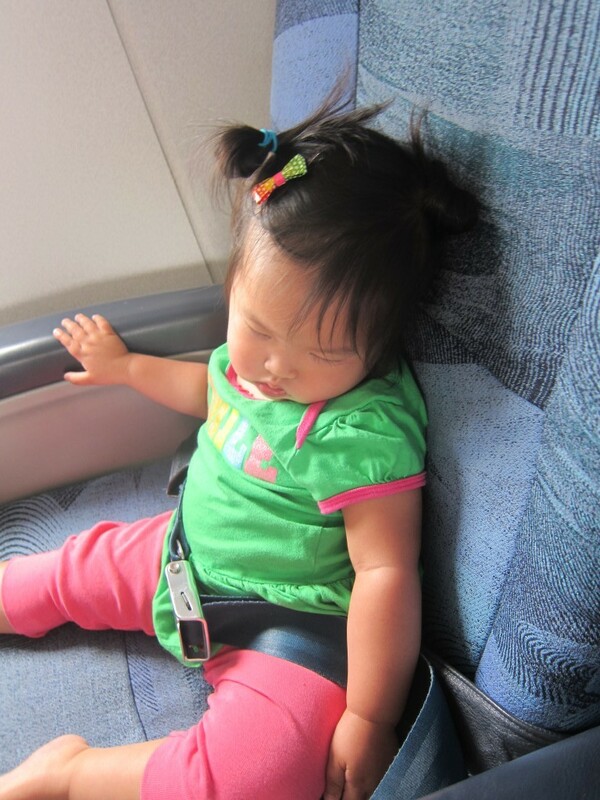 On Air Canada we were told to hold M in a burping position (which they called the brace position) for takeoff/landing/turbulence, and on the European carriers we’ve flown we always get that extra seatbelt attachment (her least favorite). Anyhoo. 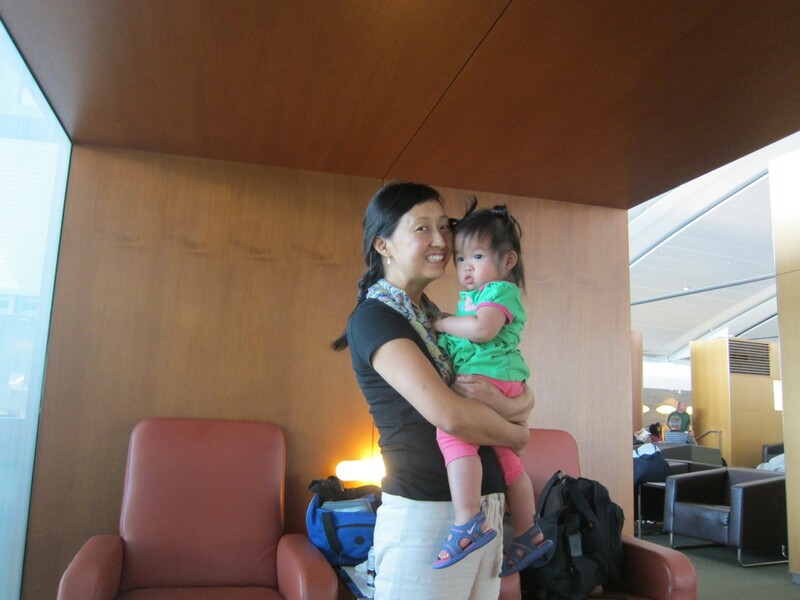 We landed in Toronto and spent some time in the Air Canada lounge in the international wing. There is also an American Express lounge in Toronto but I didn’t get to check it out because I was on daddy duty, which was composed of walking around the terminal pushing M for an hour and half to squeeze out fifteen minutes of naptime. Airports = overstimulation. They at least had the World Cup semifinal game on so I was paying attention to that. Gonna be a great flight! 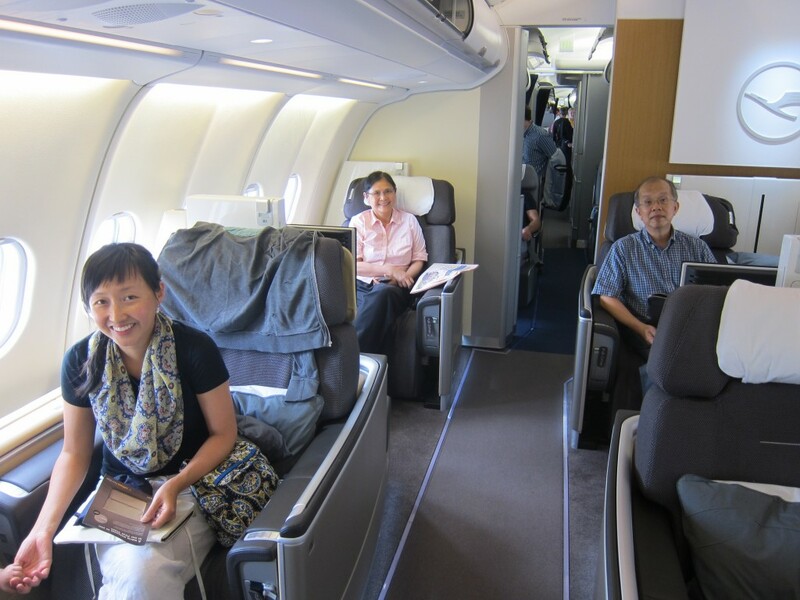 Boarding was smooth and my hopes and dreams were realized – it was a Cheung-only first class cabin. My parents, my wife, my daughter, and me. SWEET! The first class attendant introduced herself (Katherine I think) and gave us the run of the cabin. It was a great relief not to have to worry about disturbing others, though it wouldn’t have been an issue in the end. The entire cabin was ours! 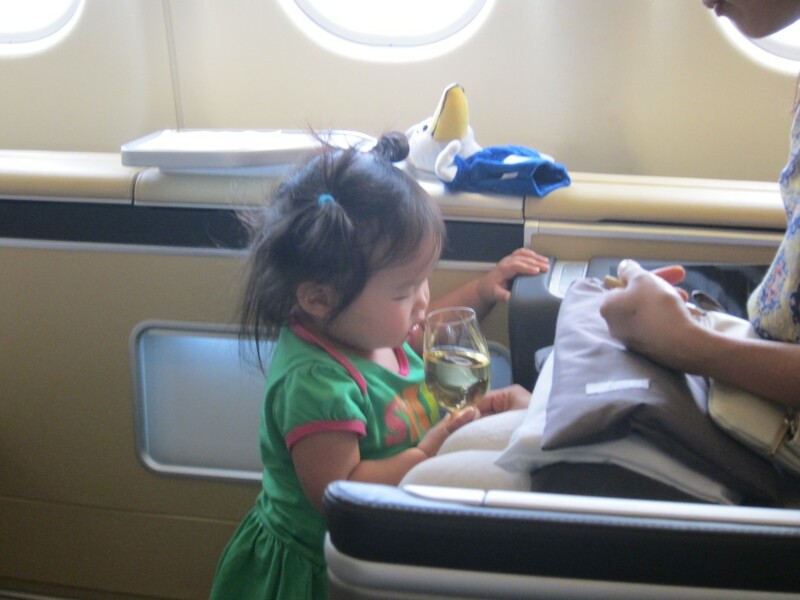 The great thing about being in first class with a toddler is the SPACE. We spent 45 minutes on the ground but I didn’t even notice because M was running around exploring everything from the ottoman to the buttons to the remote control – and that’s before the flight attendant gave her some toys and coloring books to play with. Jess and I managed to sneak in two glasses of (excellent) champagne in during all the commotion, M didn’t even notice except when she wanted to do “cheers” with us. Oh it was at this point our Dutch captain began informing us of the score in the game – unfortunately 30 minutes into the flight he told us that his Dutch team had lost – poor guy. 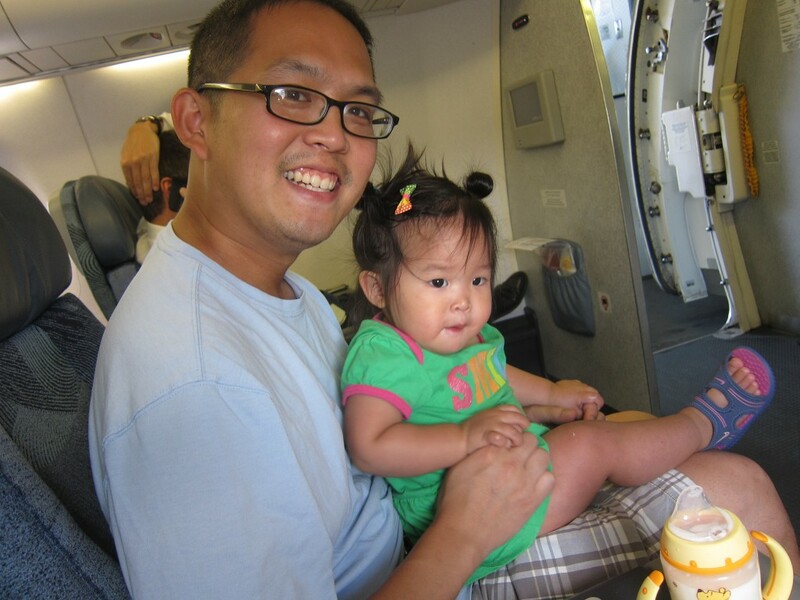 M wasn’t a huge fan of the aforementioned baby belt and was squirmy during take-off, but that wasn’t a major issue. We then decided to take dinner separately so one person could watch M at a time. I ate first, starting with some caviar (which generally is lost on me), then a trio of appetizers (ginger prawns, pork tenderloin, and salad), and culminating in my beef tenderloin entree. 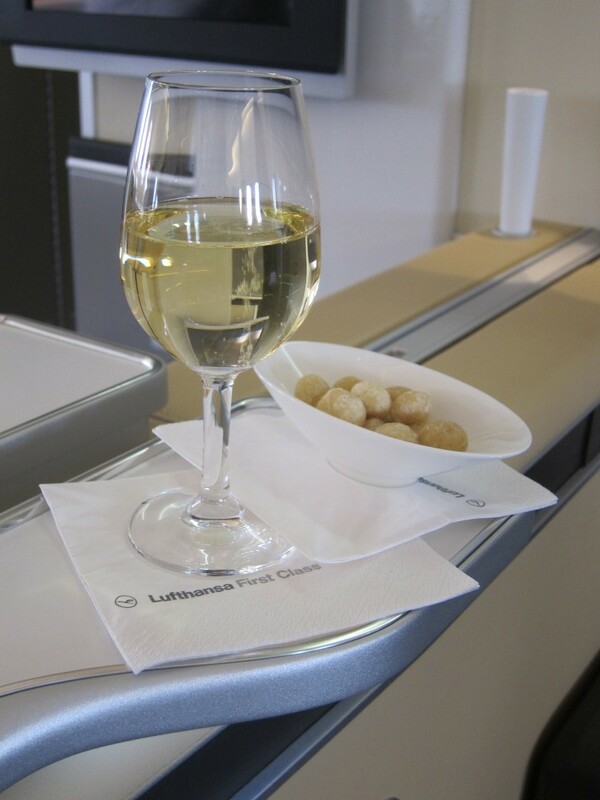 I’ve heard complaints about Lufthansa catering but this was my third first class flight with them and I’ve always enjoyed the food. In the meantime, Jess tried to feed M the food that we had brought with mixed success. She also ate some pretzel bread but turned down most of the airplane food. 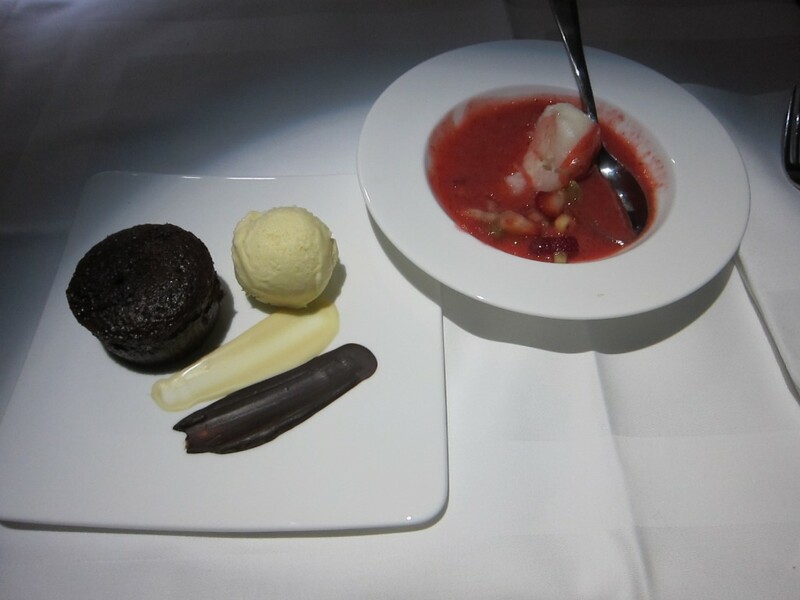 Once I was done, I asked the flight attendant to hold off on dessert so Jess and I could eat that together and I took over M duty. The four of us were all on the right side of the cabin (so we shared access to the same aisle), Jess moved over to the left side to eat while I put M to bed. In first class this was so straightforward it almost seemed like a joke. As always in Lufthansa first, the flight attendants make your bed when you ask so I asked them to make Jess’ seat into a bed for M. After that, I just laid down with her for a little while, read a book, hummed some tunes and patted her until she was down. 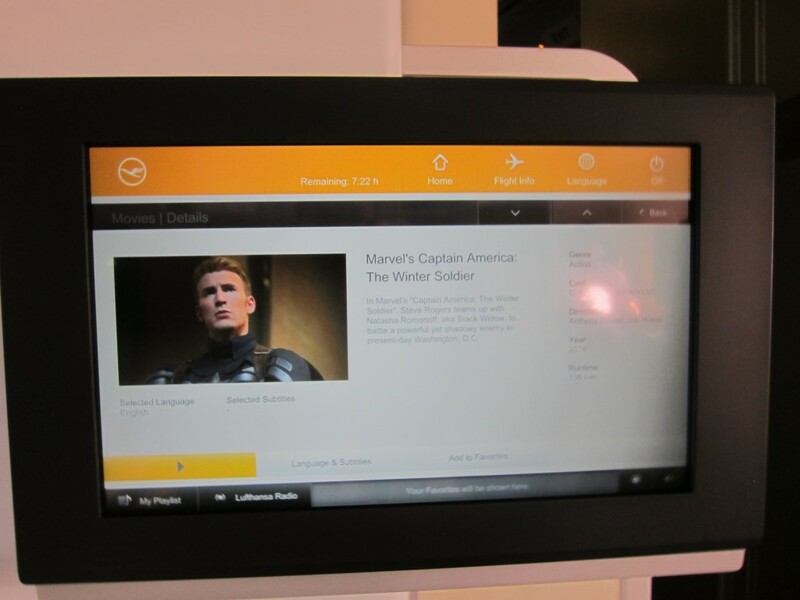 At that point I moved back to my seat and ate dessert with Jess while finishing CAPTAIN AMERICA THE WINTER SOLDIER which is the movie I had been hoping was available on the plane. Yes! Dessert was excellent, I had a strawberry gazpacho with sorbet, Jess had the cheese plate, and we each got a chocolate cake with ice cream. That’s about all I have to say about that! At that point Jess got her bed made and went to sleep while I finished my movie. I went to sleep with about four hours left in the flight, but M started crying half an hour later. She likely would have settled herself like she does at home, but just in case she was disturbing anyone in the cabin behind us, I moved over to her bed and she settled down pretty quickly. She had another little “sleep adjustment” two hours later, but other than that she slept very soundly for about five hours on the flight. The one negative thing about the flight is that it was incredibly dry, not that Lufthansa really had any control over that. That really exacerbated M’s cough and she was coughing/wheezing in my ear all night. So lying next to her my ability to sleep was greatly impeded and I only caught about an hour of solid rest. When breakfast service started M woke herself up so the three of us ate together, though I was exhausted at this point. Before we knew it we were on the ground in Munich. M pretty much held it together even though we were walking through the terminal (with her awake) at around 1 AM home time. I needed some rest before picking up the car so we spent half an hour in Munich’s Lufthansa First Class lounge, where we also had our passports processed (a nice perk). After a two hour drive to Garmisch-Partenkirchen, we checked into our huge house, grabbed a quick lunch, and then I don’t know what happened because I fell asleep for sixteen hours straight – ten of those next to M. We decided to sleep with her to help her with the jetlag and also to monitor her cough. I thought she was over jetlag because she woke up normal time but since she’s passed out again I’m not so sure. I guess we’ll find out. Looks like we’re in for five straight days of rain – yikes. Hopefully we find something to do! 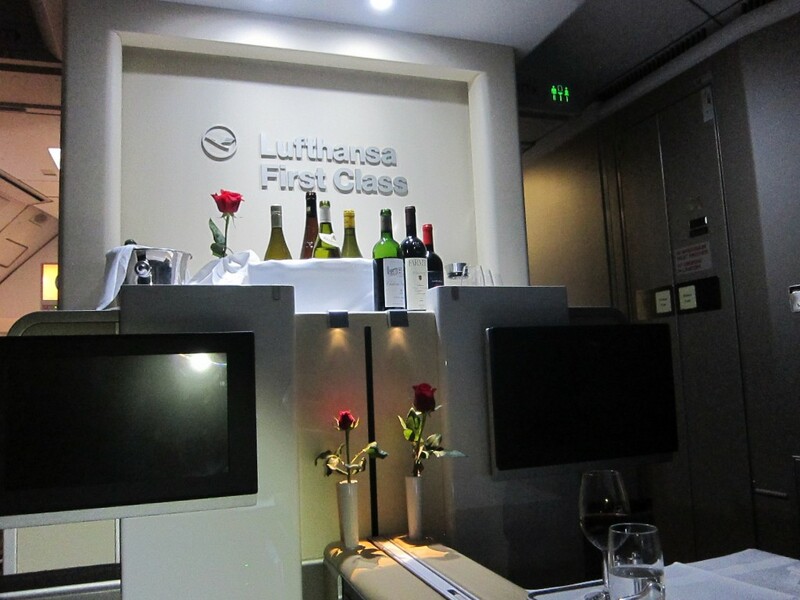 Our Lufthansa first class flight with M went better than expected. 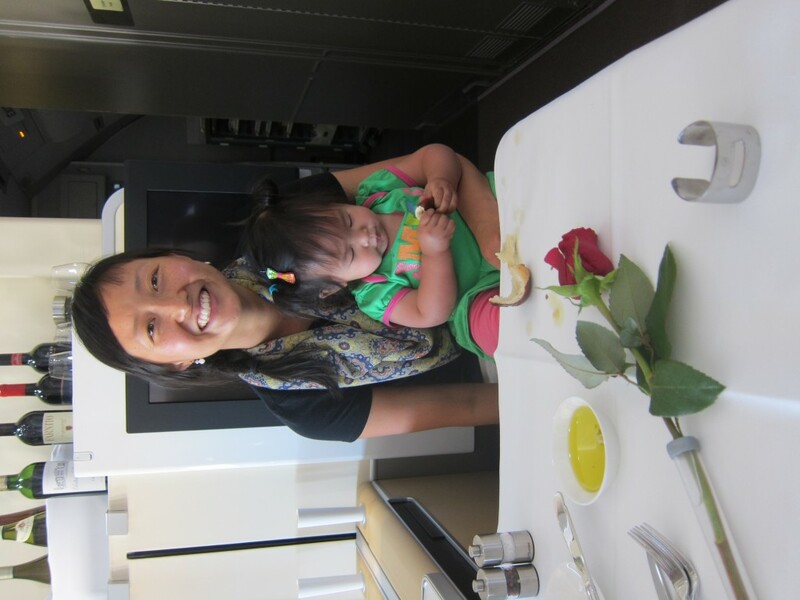 She enjoyed all the space and having such a small cabin really allowed the flight attendants to give us the help we needed. 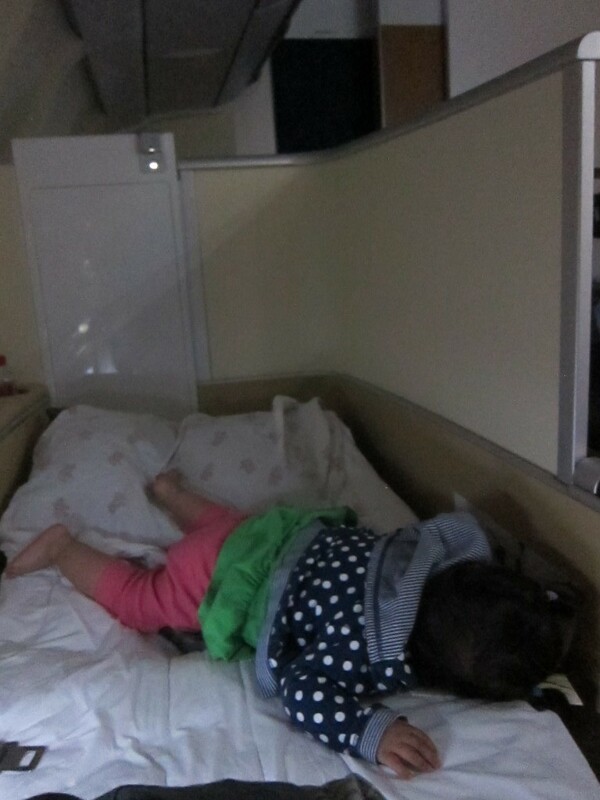 Having a lie flat bed for her to sleep on made a huge difference as well. Best of all, Jess and I even got to enjoy ourselves a little bit. Hopefully M gets over her illness and starts enjoying Germany soon! P.S. – We ended up ditching the “drag car seat through terminal” contraption and putting the car seat in this $15 carrying bag we got. We threw some extra clothes and supplies into the bag and checked it in. Worked out great! 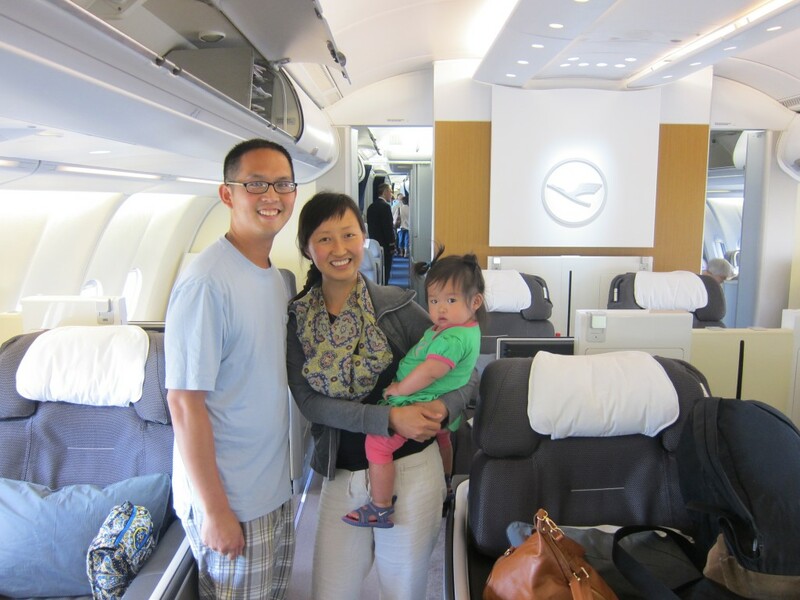 Lufthansa First Class Terminal – Good for Toddlers? Just completed a nine day trip to Vietnam. Went from San Diego to Hanoi and back in economy. Your situation looks like a cake walk. Hope your trip was an overall success. Um I’m jealous again. Have fun guys! Sounds like a truly successful flight all around. Enjoyed the report.